Superintendent says that no children were on board the plane but will not confirm if the ten passengers on board the Belfast flight were from the same company. GARDAI SAY THAT the victims of this morning’s Cork airport plane crash were all adults. Garda Superintendent Mick Finn told a press conference at Cork Airport this lunchtime that the gardai would not be revealing the names of the dead until their families had all been informed and formal identification of the bodies had taken place. Asked if the ten passengers were all from one company on the Manx2 flight from Belfast, Supt Finn said that he would not be confirming that until the identities of each of the victims was released. He also would not confirm if the two crew members on board were among the casualties. As far as I could see, one of the engines caught fire. The airport fire staff had it extinguished within a matter of minutes. He also said the main number of the fatalities were “to the fore of the plane”. Email “Gardai say the Cork Airport crash fatalities were "to the fore of the plane"”. 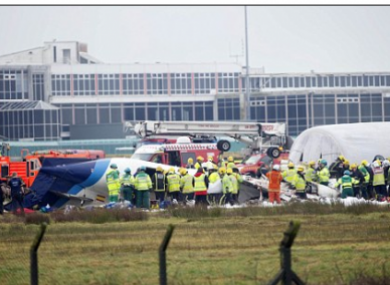 Feedback on “Gardai say the Cork Airport crash fatalities were "to the fore of the plane"”.